How do we measure masses of astronomical objects? What is Dark Matter and how do we know it’s there? How did the Universe begin? All these questions can be addressed with relatively straightforward observations and maths suitable for school students. A number of resources are available below, including Heavens’ Kitchen, a Universe simulator. Heavens’ Kitchen allows you to create your own Universe, with various amounts of normal matter, dark matter and dark energy. It then shows how observations of your Universe would compare with those we make of our own Universe, such as the Cosmic Microwave Background and the distribution of galaxies. 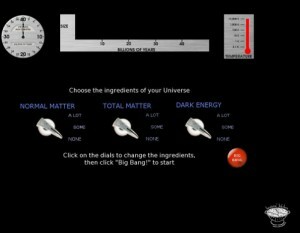 At the beginning of the simulation, you can alter the initial amounts of normal matter, total matter, and dark energy, to see what kind of Universe your ingredients create. You will need Java 1.6 or later already installed – this should be standard on most modern machines. If you are using Windows, you should simply be able to double-click on JavaApplication2.jar, which should be in the directory you unzipped to. It’s designed to run at 1024×768 resolution, so change your resolution to that first if you want it to look its best. Once running Heavens’ Kitchen, pressing ‘q’ or Escape will exit the program. If the installation and use of Heavens’ Kitchen proves too difficult to achieve, then a much simpler CMB simulator is available. This allows the user to change the relative amounts of normal matter, dark matter and dark energy in the Universe and see how it would affect the Cosmic Microwave Background. The resources below cover a wide range of topics in gravity and cosmology, and can be run together or separately. See the teacher outline for more details. The original Heavens’ Kitchen resource was developed for an Oxford University exhibit at the 2006 Royal Society Summer Science Exhibition. Lead developer: Jonathan Patterson, Oxford University Astrophysics and Theoretical Physics sub-departments.